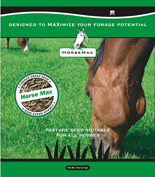 HorseMax is a long-term mixture designed to be very low in sugar, but capable of producing exceptional ground cover and abundant forage. 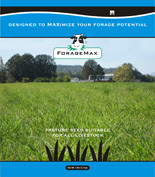 HorseMax will produce a very dense pasture suitable for grazing, exercise and recreational activities. From the second year forward the mixture can also be used to produce a crop of hay for essential winter forage. Available in 5 and 25 lbs bags. HayMax is an ideal mix for areas where two or three cuts are required per year, and where high quality yield is essential from the harvested material. It is recommended for crop rotation systems where the grass fields are renewed every 3 to 5 years. HatMax can be used for haylage, hay, and green chop. 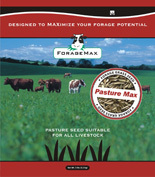 PastureMax is an all-purpose grazing mix with high forage yields, outstanding palatability, excellent grazing tolerance and late heading. It is best utilized in crop rotation systems where pastures are renewed every 5 to 7 years and where high forage quality is vital. It is suitable for most livestock including cattle, goats, and sheep. Perennial Deer Mix designed for feeding deer year after year. Available in 3, 5, 10, 25, and 50 lb cloth bags. Annual Deer Mix designed for late season planting.